Greg Hurst scored his first goal for the Fifers after arriving on loan from St Johnstone. Picture by George McLuskie. It's always good to get the first win of the new league season - even better to get it with as many positives as this. 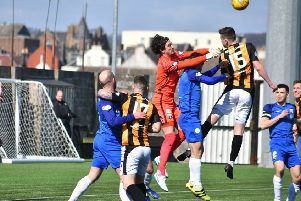 The video package of the game will make easy viewing for Bayview boss Darren Young as he watches a Fife side go toe to toe and come out on top of a decent Alloa Athletic. The Wasps are never far away come the end of the season but their best wasn't good enough against East Fife. From front to back the Methil men impressed. Ryan Goodfellow proved what a top shot stopper he is, denying Craig Malcolm from point blank range during the opening stages. It was the only time when a sturdy looking defence was breached, Jim Goodwin admitting after the game that he had to switch his side's tactics entirely towards the end by deploying three target men in an attempt to get some change out of the Methil backline. In midfield Kieran Millar looks to be a real find for the Fifers, always busy, strong and keen to get his foot in, the former Stenny man has formed a solid partnership with Pat Slattery. Nathan Flanagan was a joy to watch at times on one wing while the directness of Paul Willis on the other caused the Wasps problems all day. Up front Chris Duggan again proved a handful and was unlucky not to get on the scoresheet during the first half with a quite sublime bit of skill, flicking the ball over his marker's head not once, but twice. The hard work seemed to have been done, only for Duggan to fire his effort over the bar. East Fife have benefited well from what appears a terrific youth structure at St Johnstone in recent seasons. Jason Kerr and Mark Hurst have both arrived and made big impressions. The latest recruit from the Perth club is Greg Hurst and the 20-year-old scored the game's only goal when he finished off a fine move forward from the Fifers. East Fife worked the ball down the wing where it eventually made its way to Willis. He hit the touchline and squared along the goal, only for Neil Parry to beat the ball back out into the six yard box. But Hurst was waiting to pounce, and he scored his first goal for the Methil men. Things could have got better for him and the Fifers not long afterwards when Parry couldn't claim a cross and the ball dropped kindly for Hurst a few yards out. This time he couldn't control his strike and hit the crossbar. His defence bailed him out, though, holding firm under Alloa pressure. It was a terrific first three points of the season from a side which is really finding its feet. And with Chris Kane, Mark Lamont, Jonathan Page and Kevin Smith all to return to it - who can say how high the Fifers can fly this season?